Around 800 members of the Public Service Alliance of Canada (PSAC) marched from Allan Gardens to the Toronto office of Finance Minister Bill Morneau on Parliament St., insisting the Liberal government should be held accountable for the Phoenix pay system crisis. “Clearly we want the liberal government to fix Phoenix. 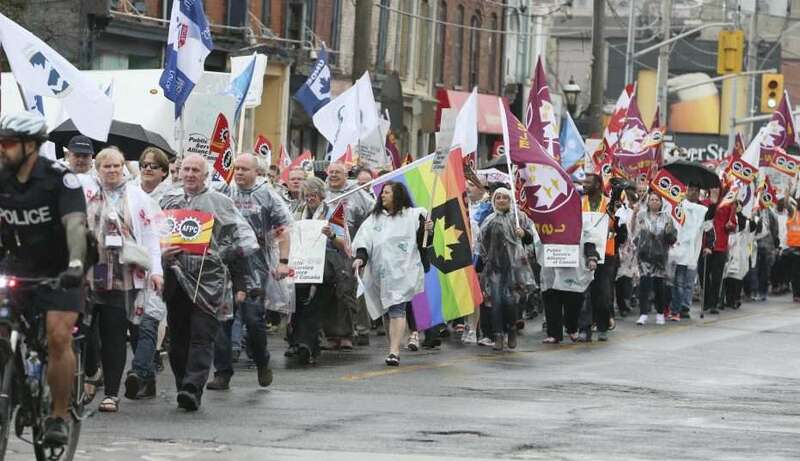 Our members deserve to be paid every payday, on time and correctly,” said Robyn Benson, president of PSAC. The rally was one of many that have been rolling across the country with members arriving in front of different MPs offices since the controversy started two years ago. The Phoenix payroll system was implemented by the federal government to replace an aging pay system. But it has been riddled with problems, sometimes underpaying civil servants. “Two years ago I received a paycheque of zero dollars. My wife was pregnant at the time with twins and she looked at me and said, ‘Do we take the gifts I bought for our six-year-old back to the store?’” said Tim Warmington, who works for the Department of Canadian Heritage in Ottawa. A spokesman for Morneau’s Toronto office said he had no comment.